Datasets let you reuse your data prep work across as many metrics as you want. In practice this lets you save a bundle of reports with their transforms and joins, and reuse it. Do the hard data work once. Let's say for example, you have metrics that show you advertising spend and ROI. You have 2 platforms you spend money on, Google Ads, and Facebook Ads. 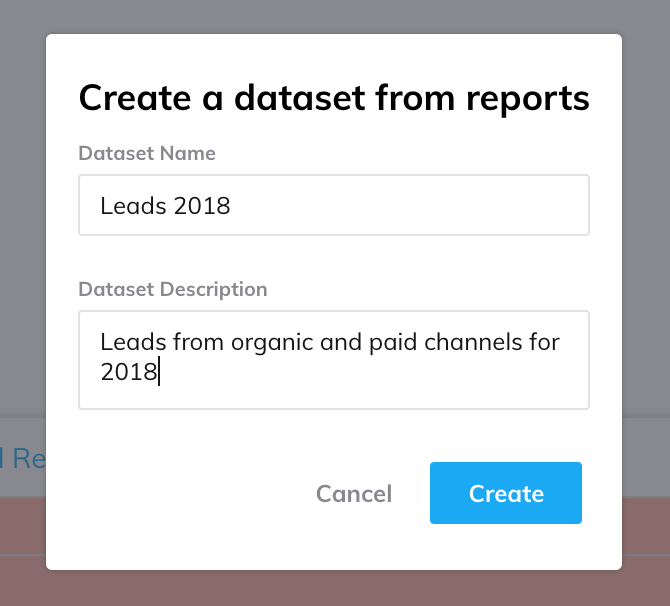 If you have 3 metrics, you have to pull in 2 reports, create a master report to join, then add transforms on top of that to get to the data you need. You have to do this work each time you create or edit one of those metrics. Using Datasets, you would do that work once, then just use that work in other metrics with 1 click. There are 2 ways to create datasets. 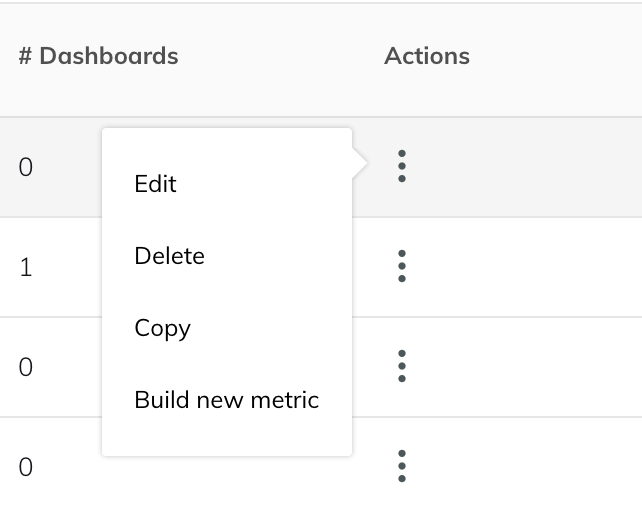 You can create a dataset from the Settings management page, or from the Metric Builder. You can manage datasets from the Account Settings page. Click on your Name and Profile Image at the top right of the dashboard and chose 'Settings'. Click on the 'Datasets' tab. Here you will see a list of all your Datasets. Click on the 3 dot menu at the right to edit, delete, copy, or build a new metric on a specific dataset. You can see what data sources were used to create the dataset, who created it, how many metrics the dataset powers, and how many dashboards it appears on. To create a dataset from the dataset settings page click the Add Dataset blue button at the top right. This will open the Dataset Builder, which is just like the Metric builder but without the charting tab. Click the 'Create Dataset' button on the far right of the report tab. NOTE: This will convert your reports into a Dataset. There is no undo. All your data and work is saved, but it is now a dataset. This will open the name and description box. Fill it out and hit 'Create'. Your reports are converted to a Dataset. To edit them, you can click 'Edit this Dataset' and it will open in the Dataset Builder in a new tab. It is simple to create a metric using a dataset. In the normal Add Metric flow, pick the dataset you are interested in. Click 'Get Data', and start to build your metric. Dataset playbooks are ready-made datasets using the most-common reports and data preparation for many of our data sources. You can use a dataset playbook and edit it to match what you want to use. Learn more about using dataset playbooks. You can create a dataset and define metrics in your company once. So when your definitions change, all the metrics update as well. If you have someone in your company who is very data literate, they can prepare datasets for all the other users who want to analyze data, but don't understand exactly the steps needed to get it prepared. If you are constantly pulling in the same types of reports, and doing the same types of transformations, and joins, datasets are really going to help speed up your work.